It’ Michelle here today and I am so excited for my first day on the blog with all of you. I have a video today on how to create boxes for card sets. As cardmakers we tend to make lots of sets to give as gifts, I find that if I add a pop dot or two to them they are too bulky to fit in the clear plastic boxes that you can buy. I get frustrated having to use 2 boxes for 10 cards and envelopes. Every tutorial I found had mega amounts of math. I am all about simplification. I would rather stamp than do the math. 🙂 So I sat at my desk for hours on Saturday and finally figured out a super simple formula. I hope you enjoy. I also created a PDF for you use if you want to create your own box. In the PDF it shows you how to make the window on the box for a variation. You can download/print the PDF here:Card Box Tutorial ***edited to add…I have posted the tutorial on my personal blog. You can right click or print to save until I can get the kinks out of the PDF. I am sorry for any inconvenience. You still have time to enter Challenge #3, Topsy Turvey–Use a sentiment as something other than a sentiment. It closes on May 12. 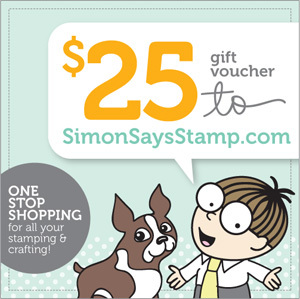 You could win a gift certificate from the fabulous Simon Says Stamp! Fabulous Video, thanks for the tutorial on boxes. Great Video Michelle! I have run into the same problem with boxes. Can't wait to try this out for my next card set 🙂 p.s. I <3 your accent! Great video! I can't wait to try these boxes! Great video, but when I try to download the pdf file, it says I don't have access. Really enjoyed the video, thanks so much! Great video and I love how you can customize each box with the different stamps etc to match the cards. The boxes are just beautiful. Thanks for sharing. Absolute genius. I avoid doing giving card sets because I hate the boxes. You've made it so easy even I can do it. THANK YOU! Love this tutorial Michelle! The boxes are just as beautiful as the cards, I can't wait to make some of these for myself! Great video and design. I'm bookmarking this! This is a keeper! Great video Michelle! Love the card sets – so pretty! I'd like a closer look at the cards in the flowered box. They look lovely, the quick peak we got. Awsome video!! I can't wait to try making some boxes! Always wondered what people put them in to sell them or give as gifts!! Thanks so much!! Michelle very useful tutorial, loved your boxes, they are beautiful and very easy to do, thanks! I love these boxes, Michelle! Great project and step by step video–thanks for the info and inspiration! Fabulous first video!! So many great tips in this one! Hope to see more, Michelle! I certainly gonna try this!!! Great video, Michelle! I would've never guessed that this was your first video! Excellent tutorial – I love those boxes! A perfect solution and a wonderful video! Thanks for sharing. Wanna make some of those boxes! Thanks for the video and pdf! Michelle, your idea is gorgeous. I am just about to try to make my first one after seeing your great video. No need to ask to be kind…. your video is excellent!! Thank you so very much. I love making boxes but can't figure out the measurements for anything. Thank you VERY much!